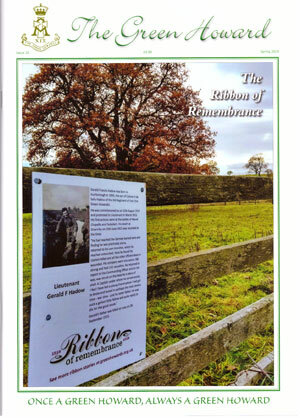 The current issue of "The Green Howard"
The Green Howard is a magazine that is designed to keep former Green Howards in touch with the Regiment, as well as being the magazine for all Friends of the Green Howards Regimental Museum. As such, it combines elements of the former Friends of the Green Howards Museum Newsletter and the former Green Howards Gazette. The Green Howard contains many articles on the history of the Green Howards regiment. The journal is published in full colour, and is a high quality magazine. It should be essential reading for all those who care about the Green Howards regiment. The Green Howard is issued twice every year, - in the Spring and Autumn. Select the image above to see what is in the latest edition of The Green Howard. Select the link below to see the details of all published editions of The Green Howard. Copies of The Green Howard can then be ordered if required. The previously published Friends of the Green Howards Museum Newsletter provided a wealth of information on the history of the Green Howards, and anyone wanting to know more about the Regiment is recommended to check this source. Details of the contents of the Friends of the Green Howards Museum Newsletters can be viewed by selecting the link below. Copies can then be obtained as described on the appropriate page. All Friends of the Green Howards Regimental Museum receive the Green Howard as part of their membership. If you are not a Friend but would like to obtain a copy, or have missed out on earlier editions of The Green Howard, then please send a cheque or money order for £6-50p (includes postage) to the Green Howards Museum, Trinity Square, Richmond, N Yorks DL10 4QN.